Philip Masiello, CEO of Hound Dog Digital Marketing, can tell you. Fueled by decades of his experience in marketing strategy and entrepreneurship, Masiello’s THINK ENGAGE THRIVE! tears down marketing models created in a data-poor age, offering common sense alternatives that take marketing out of the textbook, into the real world. Through stories of lessons he learned as an entrepreneur, TV shopping marketer, and million dollar Amazon seller, Masiello contrasts dysfunctional corporate cultures with the best-known companies doing marketing right, including Apple, Amazon, and Dunkin’ Donuts. In THINK ENGAGE THRIVE! you will learn to use today’s unprecedented customer data tools to intelligently target your customers. By applying the principles Masiello lays out, you’ll convert clicks into sales and service into retention. 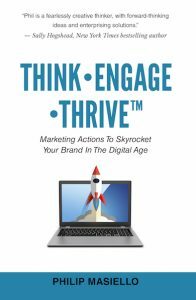 Your business will skyrocket as you THINK ENGAGE THRIVE! Masiello goes beyond marketing 4.0 and other internet marketing concepts to show you how to use the marketing tools to grow your business. Whether you are a startup business or a Fortune 100 company, this book will explain the concepts of digital marketing and marketing strategy in a way that is easy to understand. I am an entrepreneur and marketer. My first business was founded when I was 27 years old. Since that time I have gone on to found 5 other businesses. While the business landscape has changed, marketing techniques have not, and they should. This book is for marketers to provide them with a more modern framework for success. In this chapter, I’ll briefly go over what it means to THINK, ENGAGE, and THRIVE. Before I talk about what those terms mean separately, I want to make it clear that these are not distinct phases you’ve got to work through one at a time. They’re part of a continuous, repeating cycle. Whether you’re looking to establish a new business or to break through barriers that have held back a company, you’ll need to THINK ENGAGE THRIVE both serially and simultaneously to achieve your goal. I say simultaneously because the parts of this cycle blend together in so many ways that even setting them out in order can be misleading. When you’re getting set to launch a new venture, THINK will obviously come first, since planning goes into everything you do. But you don’t stop thinking at the moment you ENGAGE. In fact, your first sale should be a trigger to think about what went right and what could have gone better. THINK is the most fluid phase. You should never stop thinking about improvements to your marketing plan. ENGAGE and THRIVE are the results of clear thinking and follow-through. THINK paves the road, ENGAGE drives the car, THRIVE is your destination. Of these three, ENGAGE is the most particular to the marketing field. When you ENGAGE, you make an emotional connection with the customer. How do you tell when you’ve engaged? That’s easy. You sell product. See how this fulfills my definition of marketing? Consider an example. Let’s say you rent out some space at a mall. You’ve got a machine that makes sno-cones. How are you going to get people to buy? Through marketing. For your sno-cone business, marketing might mean dancing around in a cardboard cone, handing out samples to kids coming out of the movie theater. The suit costs you $40. Fifty to a hundred sno-cones are maybe $1.50 in syrup. Your rent and electricity are routine expenditures, so they don’t figure into the marketing budget. Time does, of course, so say you spend ten minutes giving out product at six different showings per day, for a total of seven hours invested in the course of a week. During that week, your sales triple. Why? Because the kids you hand your sno-cones to tell their friends who tell their friends who show up at times you’re not giving product away. Better yet, their moms tell their mom friends, who don’t mind paying full price for a half-hour of peace while they’re trying on chinos. Because you took the time to ENGAGE, your business boomed. Your financial investment was minimal, and nothing compared to your return. Thinking about who your customers are and what they love paid off. Now imagine that in the middle of your promo week, the mall holds a special event with clowns and a balloon animal guy. Think it’d be worth changing your plans to get in on the action? That’s why you have to keep thinking. Be flexible. Keep reading the data. Be ready to adapt. You’re selling two hundred sno-cones a day. How do you get to two thousand, or twenty thousand? Maybe the mall cancels the balloon guy. What would it cost you to bring one in? THINK ENGAGE THRIVE is a cycle because once you find something that works, you go back to figure out what will work even better. Every time you engage with customers, you learn a little more about what they love. You build your customer base and set yourself up to grow. Now that we’re clear on how to apply THINK ENGAGE THRIVE, I’ll go deeper into each element, starting with THINK.